Does anyone know when Quebec started using black-on-yellow exit number tabs? I don't know if it extends to all their freeways, but it seems to be commonplace on the autoroutes. I'm a big fan of them. They're unique, stand out, and I think also make it clear to the motorist that they have a specific purpose, and aren't just mileage (metric?) numbers or anything else. Now I actually like that a lot. Especially if the off-ramp icon was horizontally flipped to indicate a left exit. Note that the speed limit has been «raised». I would argue as many people are doing 70 mph now as did 60 mph then. I would agree the tabs should probably be on the upper-right or upper-left of the primary signage (obviously depending on which side the exit is on). Although perhaps like Caltrans, it's done this way to account for wind? The best explanation for these tabs is that it mimics the design used on the autoroute system in France. Except as far as I'm aware France doesn't use that design for its autoroutes. In any case, Québec's signage is certainly unique, even discounting the different language. The simplified tab that is now used is no longer as reminiscent of the French design as the older sign, but the similarities of the older design to that that is used in France, should, in my opinion, not be overlooked. The inspiration for the Quebec design from the French design does appear to be there, but France may have in turn copied it from elsewhere. Also, I'd be curious to see pictures of French signage contemporary to the older Quebec design which featured the symbol. Hence why I used the term 'European' above. I actually like the symbol and wished it was still used for Quebec signs (and dare I say it, North American signs in general). It is also generalized in Austria (on all Autobahnen and some Schnellstraßen with enough exits to deserve a numbering sequence). Also, I'd be curious to see pictures of French signage contemporary to the older Quebec design which featured the symbol. In France, the use of the exit arrow is, to my knowledge, of recent appearance and dates back from the mid- to late-80's. So then Quebec was using that symbol decades before France was. And, by the looks of it, there is nothing on the older French signs that would have inspired Quebec's tab design. French exit numbers used to have the word 'sortie' with the number, for example 'sortie 8'. 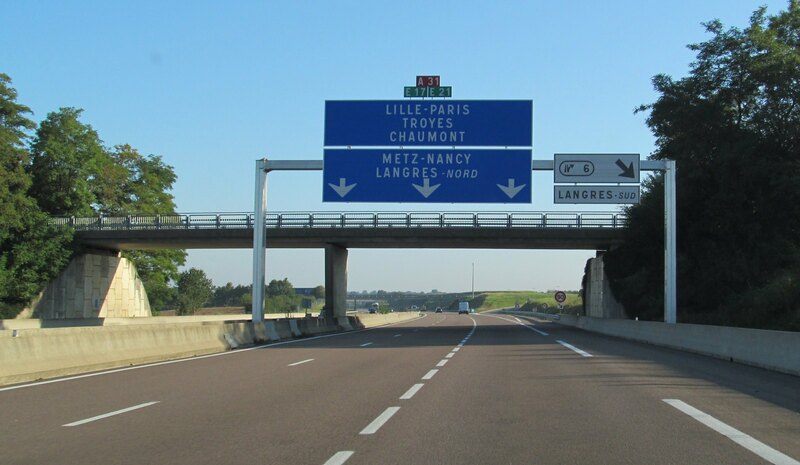 The trapezoidal tab design was most probably inherited from the trapezoidal shape of the Office des Autoroutes exit signs (tolled autoroutes, namely A-10, A-15 and A-40). 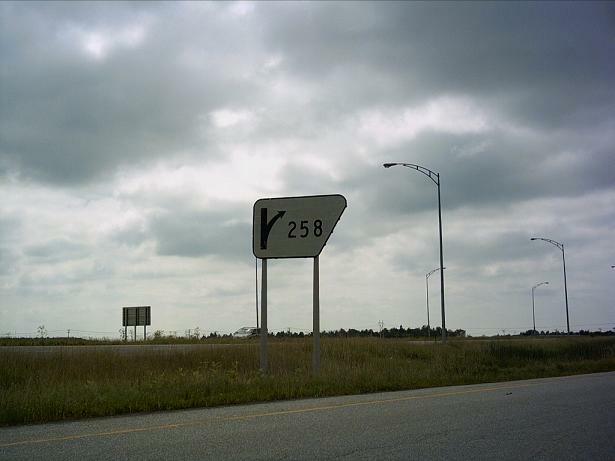 That kind of non-rectangular directional sign was found in many places in North America (trapezoidal Garden State Parkway entrance signs, for instance) and Europe (where pentagonal, arrow-like Ausfahrt ("exit") or simply with the name of the destination are quite common). 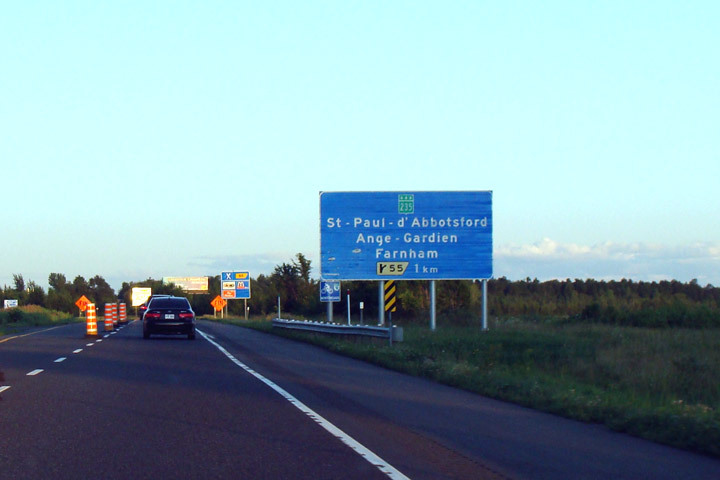 Roadside trapezoidal sign (Autoroute des Laurentides at exit 6) : Abord-à-Plouffe, Laval-des-Rapides, Boulevard Cartier, Sortie/exit 6. 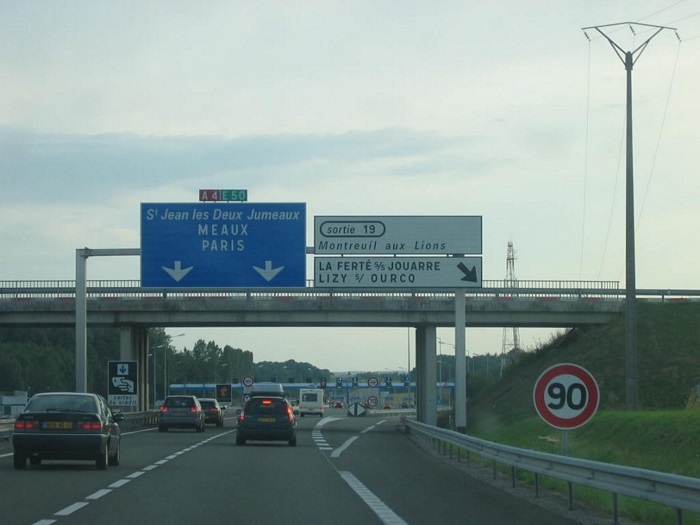 There seem to have been few to no exit numbers on autoroutes that were not under the management of OAQ. A-40 at A-25 in 1967. 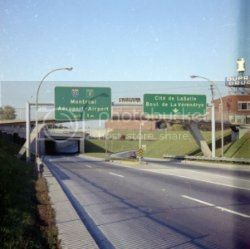 Exit sign at Rue Sherbrooke on A-25 in 1970. 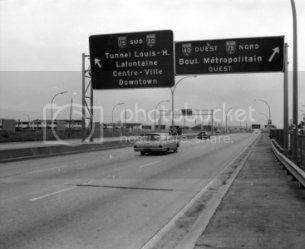 Exit sign at Rue Hochelaga (now "Montréal Centre-Ville") on A-25 in 1970. 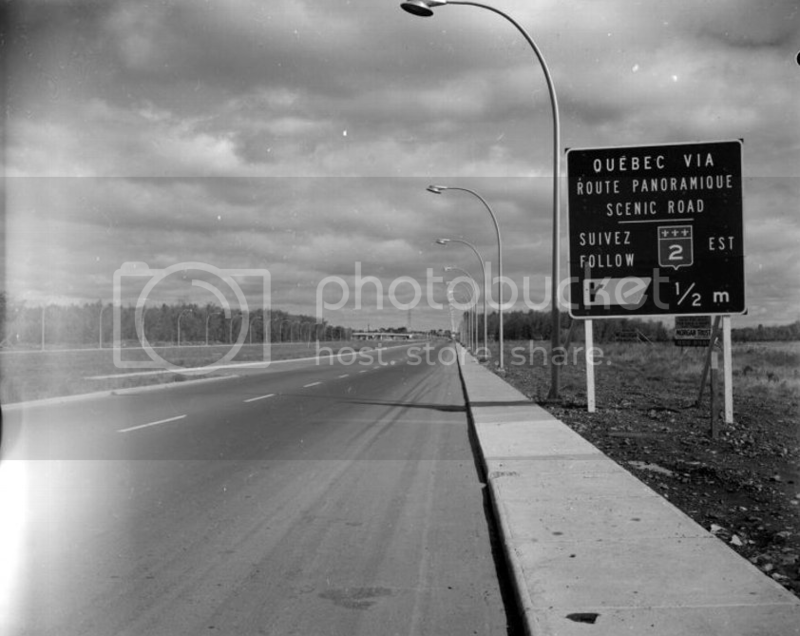 What is now exit 1 on route 138 near Mercier bridge in 1970. 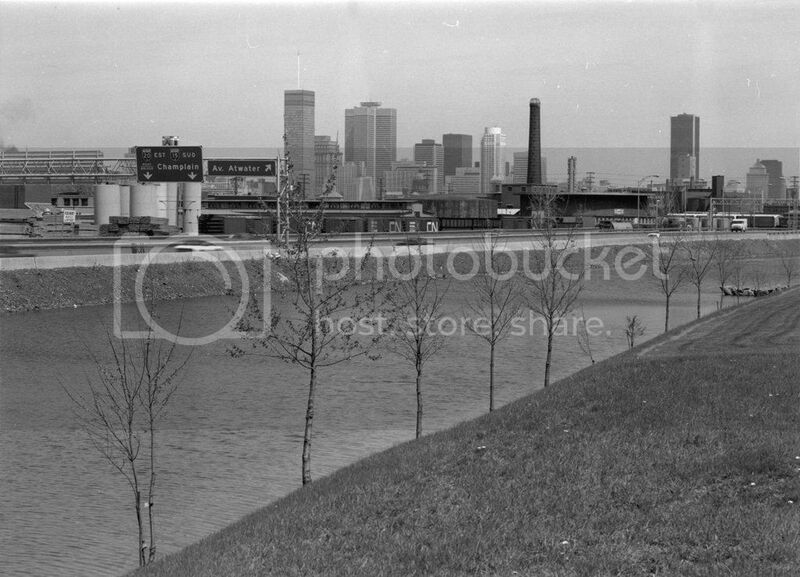 Champlain Bridge approach in 1970. All pictures from Archives nationales du Québec. 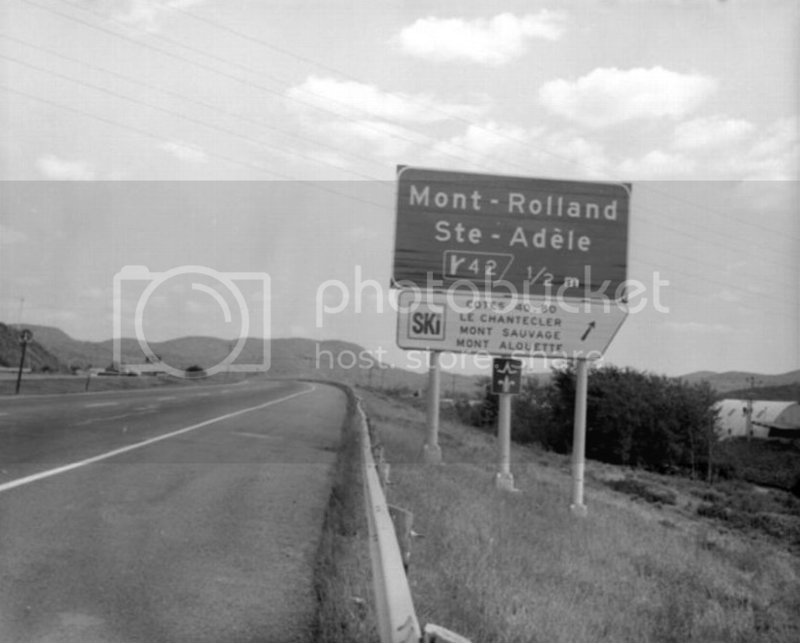 I also have old maps (pre-1974) that corroborates this hypothesis : A-20 and OAQ had sequential numbers for their exits : Autoroute des Cantons-de-l'Est exit 1 was at Taschereau boulevard (R-134), Autoroute de la Rive-Nord exit 1 was at Henri-Bourassa boulevard in eastern Montréal, Autoroute des Laurentides exit 1 remains unchanged. 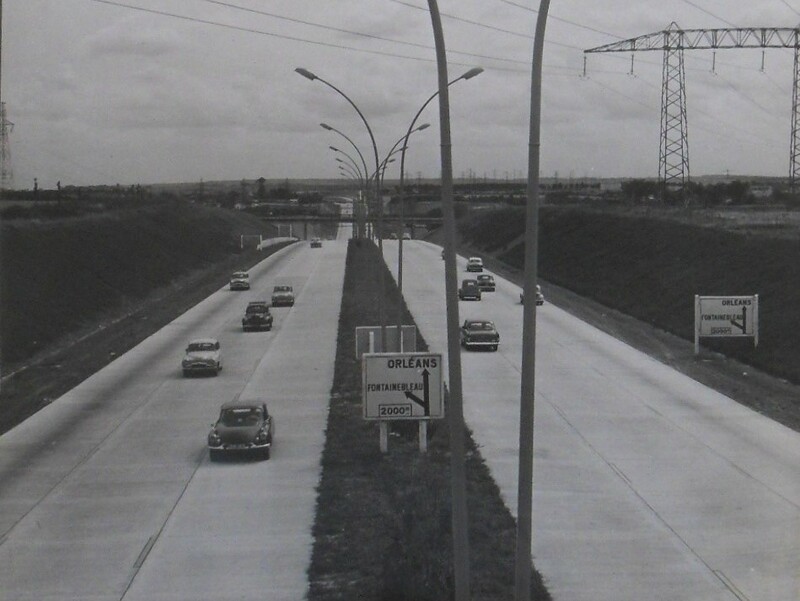 The other "superhighways" (that were only a few : A-20 concurrent with R-2 in West-Island, Montée Saint-Léonard (now A-25), Metropolitan Boulevard (A-40), Côte-de-Liesse (A-520), Décarie (A-15), Mercier bridge accesses in Montréal, Henri-IV (A-73), Duplessis (A-540) and Laurentienne (A-73) in Québec) had no exit numbers shown on map. 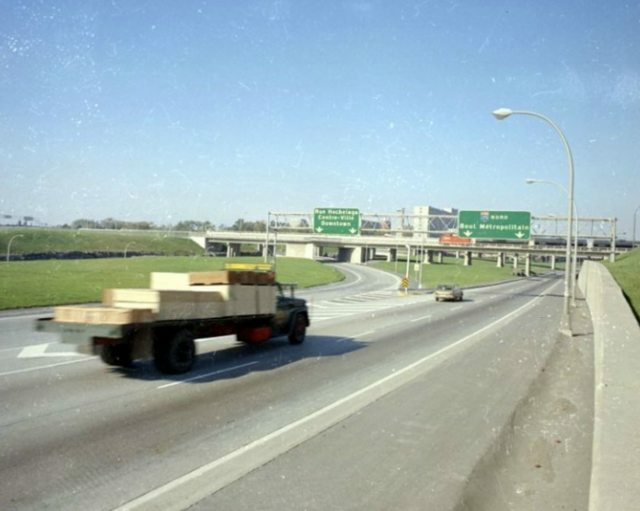 The evidence I have lead me to think that the use of the exit tab with an arrow (and systemic numbering of exits) might have been standardized with the great highway renumbering plan and conversion to metric system in 1974. I've driven enough of the Autoroute system I should've noticed, but for any left exits in Quebec, does the trapezoid point left rather than right? From pictures in this thread, plus this other one found elsewhere on this forum, it would appear that exit tabs were already in use on the A-40 by 1970. In use indeed. Generalized? I do not think so. The only exit tabs I've seen before 1974 are the one depicted by Szilasi's work in 1970 and are on Métropolitaine. They all are on temporary signs. 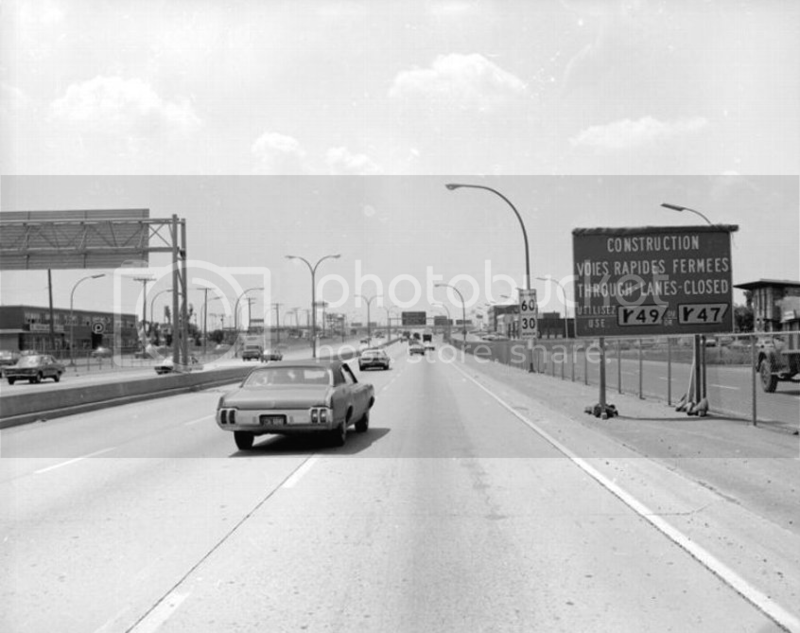 Summer of 1970 might have seen some pilot project for new signage. There's this one. 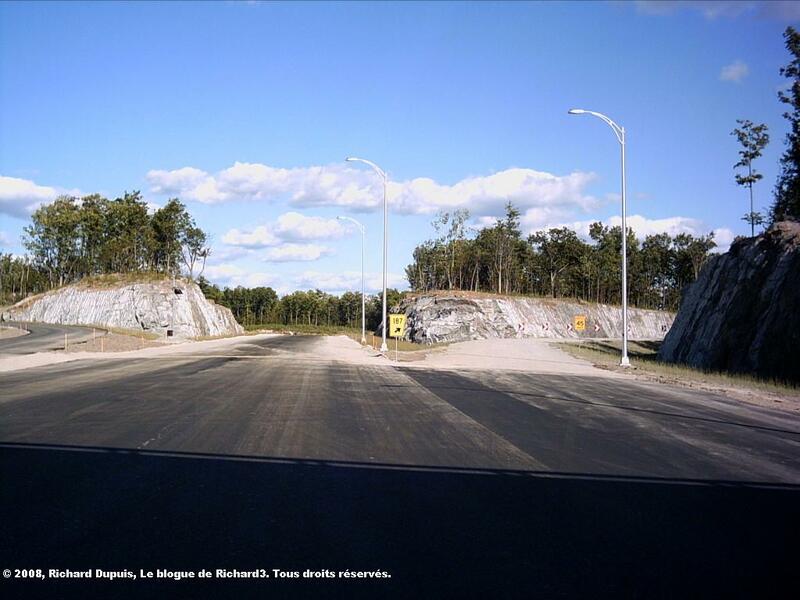 It should use "Exit 1", as it is the first exit on Autoroute de la Rive-Nord. It does not. And there's this one, with mile-based exit numbers, which on top of my head I cannot recall to have seen anywhere else (I'll have access to my old map this weekend and will surely doublecheck). 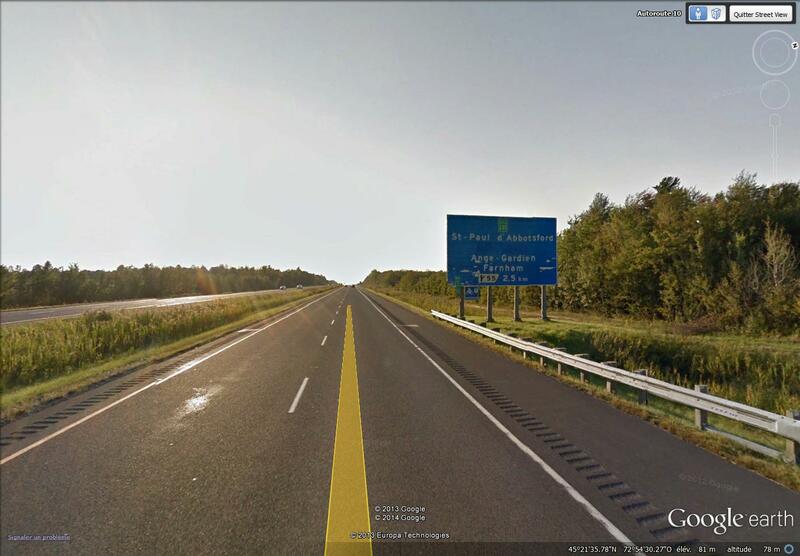 If you pay attention to the signs in background, they feature no tabs, as if the detour sign referred to unsigned exits. The numbers in miles match actual 2017 kilometre posts. Roughly this spot today, a much busier place! Another old topic being back to life! 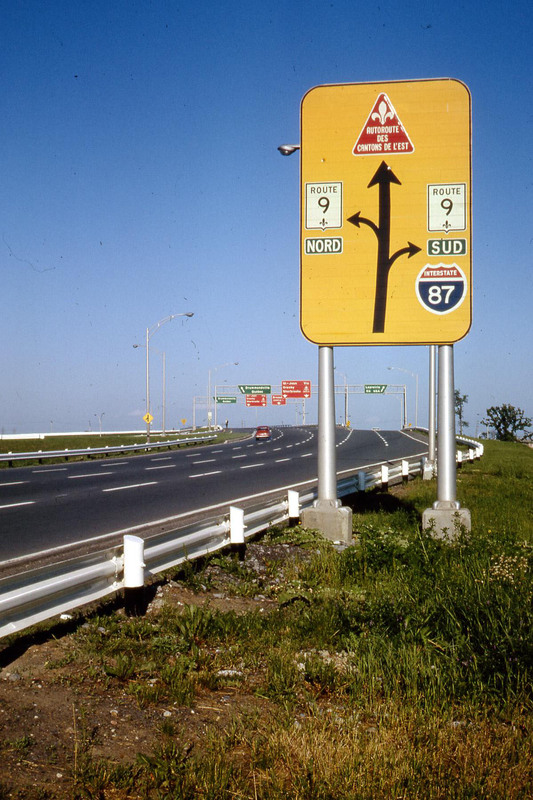 In the 1960s, Quebec's only expressways were the Office des Autoroutes' toll highways, and each one had its own supersignage color. For the exits, there were some big trapezoidal signs, but instead of black on yellow, they were white on the same colors than the supersignage. The colors were blue for North Shore Autoroute (Autoroute de la rive nord, A-40), dark green for Laurentian Autoroute (Autoroute des Laurentides, A-15 north of Montreal), and first red, then burgundy for Eastern Townships Autoroute (Autoroute des Cantons de l'Est, A-10). 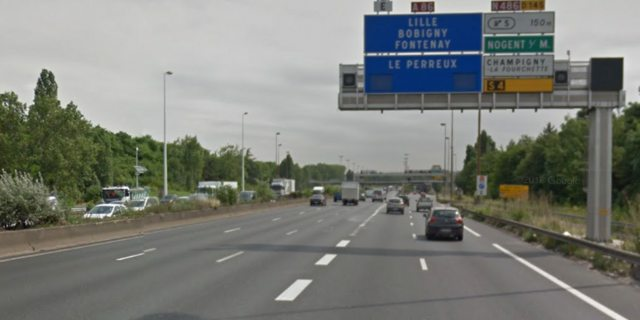 By the end of the 1970s, all supersignage on Office des Autoroutes turned blue, and the exit tabs and signs turned black on yellow. Image from Google Earth. Until the 2000s, the exit signs were big, as in the 1970s, looking like this one. My image. Nowadays, the Quebec exit signs are smaller, but still trapezoidal, with the exit number and the arrow below. My image too.